The accrual of employer-contributed funds to a qualified retirement plan according to a pre-determined schedule. When your employer gives you money outside of your regular salary, you may not have full ownership of that money right away. How and when you gain full ownership of the funds is known as a vesting schedule. If you participate in a defined contribution retirement plan, such as a 401(k) plan, 403(b) plan or a 457(b) plan, the portion of your income contributed directly by you is all yours. You have full access to that money and any earnings on that money, regardless of how long you work for the company or when you leave your job. 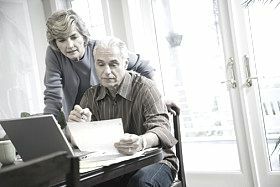 Of course, if you attempt to withdraw that money or take distributions from your account before you reach the retirement threshold age of 59 1/2, you will likely be subject to taxes and a 10% penalty fee. But if you rollover your 401(k) into another employer's plan or a rollover IRA, 100% of your contributions move with your plan. Understanding vesting becomes important when an employer matches the contributions you make to a retirement plan. The employer may regularly match every contribution, but choose to stretch out your percentage of ownership in that money over time. When you have reached 100% ownership of your employer matched funds, you are what is known as fully vested. The reason companies have vesting schedules is to encourage loyalty among their staff. "Sure, our company offers great 401(k) matching benefits. But to fully realize them, you have to stick around for a little while." How long? It depends. Different companies have different vesting schedules. There are three general types of vesting schedules for retirement accounts: immediate vesting, cliff vesting, and graduated or graded vesting. Immediate vesting is probably the easiest to understand. It occurs when no real vesting happens at all. Employees get full, immediate ownership of the employer-matched funds in their retirement accounts. With cliff vesting, the employee would get full ownership of employer matches after a certain period of time, by law, it can be no longer than three years for the typical retirement plan. Some employers will offer the benefit of employee stock options, or the right of employees to buy (also known as "exercise") a certain amount of company shares at a set price. If your set price is much lower than the market price for the stock when you exercise the option, you have instantly made money. Stock option plans typically vest in the same way as matching contributions. You either gain the ability to exercise all options at once, or the right to option some of your options each year over a period of years. Not all employers match contributions or offer stock options. Those that do make their vesting schedules and provisions clear upfront. So if you have any questions about your own plan, you should be able to find the answers easily by contacting your human resources representative or retirement plan administrator. Before leaving a job, you may want to consider the impact on your vesting schedule. If you are six months away from becoming fully vested, for example, you may want to wait it out so you don't leave any money behind. Whatever you do, don't let a long vesting period stop you from contributing to a retirement plan. Even if you don't wait around for the full benefits, even 25% or 50% of an employer match means more dollars for your retirement. Retiring Early? Here's How to Get Your Money Before Age 59 1/2. Should You Use a 26(f) Retirement Program?